Click to view a checklist for completing graphs. Click to learn how to graph in Excel. 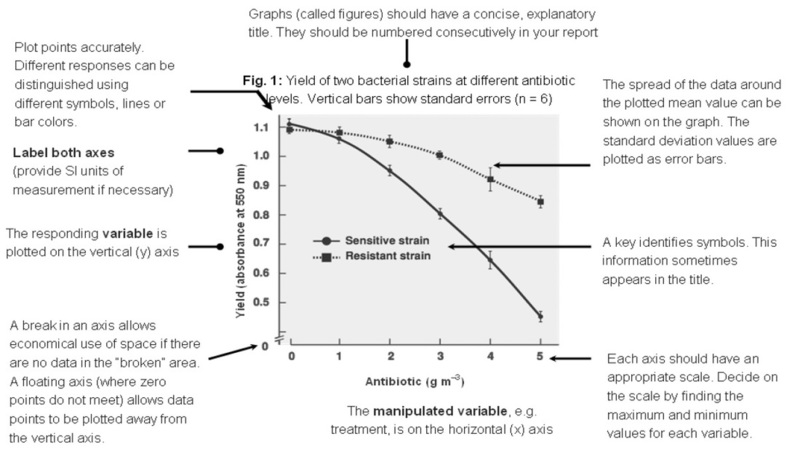 Click to learn about interpreting error bars on graphs. Click to read a short article about the effective use of graphs. 1. Is the data a percent that sums to 100% or a total amount of time? 2. Are both your manipulated and responding variables quantitative? 3. Is your manipulated variable levels continuous (i.e. time in years) or clumped into groups (i.e. 0-5 years, 6-10 years)? Designed to show a percent of a whole, where the whole equals 100%. Pie charts are used to compare data, but cannot be used to see how a manipulated variable affects a responding variable. Pie charts do not show change with respect to another variable. Designed to make comparisons of data. The data represented in bar graphs are not necessarily dependent on any other variables and the groupings are usually qualitative (i.e. grouped into categories, like blood types or color). The bars do NOT touch. Histograms are similar to bar graphs except the data represented in histogram is usually in groups of continuous numerical (quantitative) data. In this case, the bars do touch. Histograms are often used to show frequency data. A line graph consists of a series of points plotted on the grid and then connected together point to point by a line. Line graphs are only used when both variables are quantitative. Line graphs show trends, such as how things change over time. The points are plotted on the grid, but they are not joined point to point. A best fit line may be added to a scatter plot to show a trend. Line graphs are only used when both variables are quantitative. These graphs are useful for showing if a correlation exists between two variables, especially when it is not possible to alter either of the variables (i.e. in descriptive studies). Determine the manipulated and responding variables. In an experiment the experimenter will set up a set of conditions, it may be a range of temperatures or pH values, or, more common, the experimenter may choose to observe the experiment proceeding at set intervals of time (seconds, days or even years). These are the manipulated variables and always go on the horizontal axis (x—axis). The effect of the experimenter varying the manipulated variable is measured as the responding variable (the part of the experiment under observation), this is always plotted on the vertical axis (y—axis or ordinate). Mark the quantities on both axes and number them at regular intervals. Your axis intervals do not have to be the same on the x and y axis and they do not have to always start at the origin with a value of 0. Giving the graph a title. The graph must have a title which should contain a brief description of what is being investigated. Other information which may go in the title, if available, includes: the date, place and name of experimenter or collector of the data. If there is more than one graph a reference number or letter is required. For example: “Fig 2: A graph showing the change in testis weight throughout the year in the brown rat (Rattus rattus)” IS BETTER THAN... “A graph of testis weight against time” which is insufficient. Underline or use bold type for your title it makes it stand out and is easier to find on the page. Plotting more than one graph on a set of axes. Sometimes two or three sets of data (though rarely more) are plotted within the same set of axes. You must distinguish between them by using different symbols (X, Ο,  , ∇ etc) or lines (…………., ________, -----------, etc). Use a key by the side of the graph which explains the symbols or lines. Do not write on the graph itself though labels and arrows may be useful. You may wish to plot data from two different responding variables together on one graph but the values may be so different you have to use two different scales. One axis can be placed on each side of the graph.